Scania - Page 7 - ETS2 - Skins - Trucksimulator24 - Die freundliche Trucksimulator Community rund um den Euro Truck Simulator 2, Euro Trucksimulator, German Truck Simulator, 18 Wheels of Steel Reihe, Extreme Trucker und den ZModeler. Antworten im Thema: 63 » Der letzte Beitrag (Oct 11th 2014, 9:39pm) ist von Micha-BF3. Credits: Created by: MartinAircraft NOTE: REPLACE PHOENIX SCANIA SKIN Thanks for the support!! Best regards! Dies ist mein Skin "FC Bayern München" für das Scania T-Modell von Henki. Vielen Dank und viel Spaß mit dem Skin. 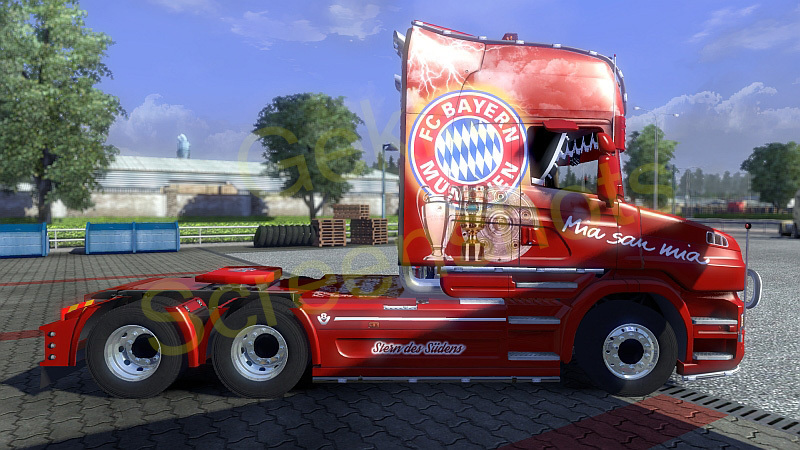 This is my skin "FC Bavaria Munich" for the Scania-T of Henki. Please upload the skin on other sites only with the original download link. the I will never do something for public again. Thanks and have much fun with my skin. Это моя кожа "ФК Бавария Мюнхен" для Scania-Т Henki. Пожалуйста, загрузите кожу на других сайтах только с оригинальной ссылкой для загрузки. Я никогда не буду делать то для публики снова. Спасибо и весело с моей кожей. Dies ist mein Skin "Oldschool" für das Scania T-Modell von Henki. This is my skin "Oldschool" for the Scania-T of Henki. Это моя кожа "Старая школа"" для Scania-Т Henki.